Quickly find beaches, restaurants, drinks, shopping, nature trails, entertainment, landmarks and more. Search for hotels, inns, B&Bs, house rentals, marinas and reservation services. Get instant access to local weather, tide charts, Island news and services. Quickly access ferry and airline schedules. Call for a taxi. Find bike, moped or car rentals with ease. Receive discounts at local restaurants and shops. Get notified of special deals. Discover articles on Block Island history, beaches, restaurants and fun activities. The Block Island App provides you with all the essential Island information even with a slow internet or cellular connection. Watch our short demo video to see the Block Island App is action! The Block Island App not only works on your mobile device but can also be accessed on your tablet and desktop computer through your browser. Click the button below to access the online version of the App! The Block Island App will give you the knowledge of a local. Find all the cool spots, the fun local events, the best accommodations, the local news and what the weather is going to be today. The Block Island App is most efficient way to get the critical Block Island information you need quickly and easily. Find the best beaches and nature trails Block Island has to offer. Over 45% of the land on the Island is preserved. Find a seafood dinner overlooking the ocean and locate all Block Island’s culinary establishments. Find a spot to sip a cocktail while watching the sunset and find the best Island bars for a night to remember. Find the best places to shop on the Island to get beach apparal, souvenirs, local crafts and much more. Get information for all your transportation needs from ferries and planes to taxi, moped and bike rentals. Find Block Island service workers to get tasks you need done fast. Handymen to freelancers are ready for hire. Hear about all the Block Island happenings from Farmers Markets to historical and music events. Need a place to stay the night? We’ve got you covered. Find the best hotels and rental homes on the Island. Figure out the best beaches on the Island, where to play sports or bike, and where to take a nature hike. Receive notifications about promotions and coupons for restaurants, merchandise and local events. You can even get the weather and tides on the Block Island App! Know when to fish and when to hit the beach. Make sure you’re prepared for any emergency. Have the contacts ready for medical personnel, police and more. Locals and vacationers love the Block Island App! Here’s a few testimonials from our users. “Love instant access to taxi numbers and boat schedules. Just find a restaurant and bam I can call them for a reservation." Here are a few answers to some common questions we get about the Block Island App. Is there an app for both iPhone & Android phones? Yes, the Block Island App is available for download in both the Apple App Store and the Google Play Store! You can also view in your browser on tablets, laptops or desktop computers. How do I use the App's search features? Just click on the search icon at the upper right of the screen and type in your search. You can search locations, events and articles in the blink of an eye. Quickly access all your favorite information. Is there more information than what's on the home screen? Yes, tap the menu (top left) to see all the content on the app. Navigate around to discover information of interest and see all of the information we offer. Why did the App ask permission for my geo-location? If you give the app permission to find your location, the app will tell you the distance to all places, show you the simplest route, and provide you with automated directions. Can I submit my own content and comments to the App? Yes, we love getting user comments! Under our menu click the “Share Your Experience” tab and submit your photos, video, and comments to possibly get featured. How do I get my business listed on the Block Island App? We offer basic, premium and enhanced listing options for all local businesses. Visit our business listings page to sign up and learn more about our all of our listing offerings. What are you waiting for? The Block Island App is available on all mobile devices, so whether you’re an iPhone or Android user, you have access to the next big thing on the Block! We’ve even incorporated geo-location features so you can find where you need to go wherever you are on the Island. The Block is finally connected to the grid and we’re not talking about wind farms! Click the buttons below to access our browser PWA or download the Block Island App on the Apple App Store or Google Play Store! Paper guides, paper maps, paper phone books, slow web sites, poor internet connectivity…welcome to Block Island. That was until Rob and his nephew Will came up with a better solution. The Block Island App the definitive app for the Island. Everything right on your phone even with spotty connectivity. 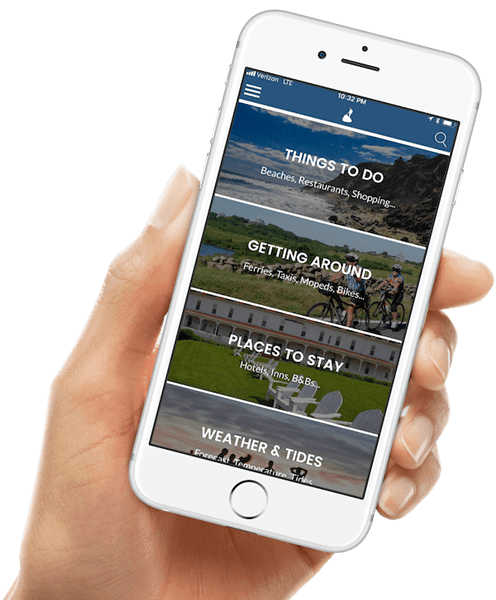 Our mission is to give visitors and islander alike easy access to ferry schedules, restaurants and shopping information, outdoor activities, weather and tide schedules, upcoming events, Island services, BI Times news and more right on their phone. In addition, we give Island stores, restaurants and service providers new ways to reach and promote their place of business. We hope you like it and tell your friends about us! Rob has worked in a variety of internet startups and e-commerce companies. He has been coming to the island since 1984, worked as a Joe at the BIG, and has a family summer home on the island. Will grew up on Block Island and is also a 12th generation Islander. He currently runs a web development company and a social media marketing agency in Providence, RI. He still spends the summer season living on the Island. Add your business to the Block Island App.